At the Sweet Chalk Festival in Lockport, NY, artists create masterpieces on the sidewalk. Jeannette Pikturna draws a tiger at the Sweet Chalk Festival. Traveling through a 1,600-ft. underground water tunnel on the Lockport Cave &amp; Underground Boat Ride. Dessert at Savor — delicious! There's nothing like being on an underground boat ride in the same place where parts of Sharknado were filmed. You can experience living history at Old Fort Niagara. Bob Emerson, executive director at Old Fort Niagara, shares the history of the fort during a talk in the French Castle. In 1901, Annie Edson Taylor was the first woman—in fact, the first person—to ride a barrel over Niagara Falls and survive. I mention this fact because A) I was in Niagara Falls this past month, and B) that’s about the only water-based transportation mode I didn’t try while in the area. And while I would not suggest that anyone try to replicate Ms. Taylor’s derring-do, I would recommend exploring the Niagara region by boat for a truly unique experience. You simply can’t visit Niagara Falls without taking a ride on the Maid of the Mist to get an up-close and personal look the falls. Looking down from the 175-foot observation tower, the waterfalls are simply massive—standing on the deck of the ship at the base of the falls is a lesson in intimidation. If you’ve ever wanted to know what it’s like to be a rubber duck in a toddler’s hands at bath time, this is probably a similar experience. Every second, more than 750,000 gallons of water plummet over the cliffs; when the wind changes direction, you not only get a mouthful of water, but a really cold shower, despite the fashionable blue poncho that you’ve been given. It was an eye-opening experience to see the sheer power of nature at that level—as well as a reminder, at least to me, of how seriously tiny humans are in the grand scheme of things. 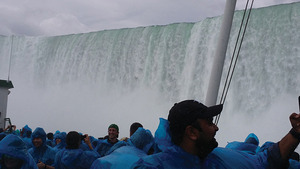 During the day, you can also get pretty close to Bridal Veils Falls by foot by taking the Cave of the Wind tour, which lets you climb down various levels of stairs to stand in the ‘mist zone,’ of the Niagara Gorge. At night, you can enjoy a completely different look at the falls as they serve as the backdrop for an evening fireworks show, which is almost, but not quite, as spectacular as the natural view. About 20 miles away from the falls is the city of Lockport, NY, where you can hop on one of three ships owned by Lockport Locks & Erie Canal Cruises—a paddle wheeler, a cruise vessel or a wooden ship that resembles the boat in The African Queen, to take a tour of the locks on the Erie Canal. I’d never been through a lock system before and found it fascinating; there’s something really disorienting about being at the bottom of a lock, and then at the top, without really noticing that the boat has moved 49 vertical feet. It’s a unique experience to watch the locks open and close, especially when you realize that you’re “locking through” the same passages that boaters traveled, sometimes towed by mules, back in the 1800s. When the canal connecting the Hudson River and the Niagara River was first built, there were 83 stone locks; now there are 35 locks that allow vessels to traverse the 571-foot difference between the two rivers. On the Lockport Cave and Underground Boat Ride, visitors can experience an entirely different view of the area, first checking out the historic Erie Canal locks 67-71, built in 1838, where the history of the Canal is displayed in a small museum, and then walking through an underground hydraulic water tunnel that was blasted out of solid rock in the 1850s. Instead of hiking all the way to the end of the tunnel, however, a boat (which I believe is eerily similar to the type of vessel that transfers souls on the River Styx) transports riders along the underground waterway through a dimly lit tunnel. The tunnel was the brainchild of mechanical genius Birdsill Holly, who also created the fire hydrant, central steam heat and the rotary pump. Oh, and in case you weren’t unnerved enough about being in a 1,600-foot underground tunnel, paranormal explorers, including SyFy Channel’s Ghost Hunters, filmed there; and the tunnel was also featured in the movie Sharknado. Obviously, I didn’t put my hands in the water. We were lucky enough to visit Lockport during its Sweet Chalk Festival, when professional and amateur artists create street art using pastels and chalk. And I’m not talking about hopscotch patterns and stick people; many of these drawings were serious works of art. Two classic pieces, Girl with a Pearl Earring and Napoleon Crossing the Alps were underway; other pieces included a 3-D interpretation of Batman in the Batcave, and an intricately rendered tiger. If you go, let me recommend that you also plan on having a picnic; seriously good box lunches are available from Sweet Ride Rentals, which is located right there on Canal Street. And speaking of food…you know I always have recommendations here. In Niagara Falls, I suggest visiting Savor, which is one of the coolest dining concepts yet. The restaurant is part of the Niagara Falls Culinary Institute, and is staffed by both professional chefs and students. It’s a gorgeous restaurant and the food is both unique and delicious; I enjoyed the spaghetti alla carbonara and was especially impressed by how the foods were plated—meals were almost too pretty to eat. While Niagara is definitely wine country, my trip didn’t include any visits to wineries (this time), but that doesn’t mean that I didn’t do any research. While touring the French castle at Old Fort Niagara, I was lucky enough to get to experience a special dinner alfresco with pairings, and let me tell you, there’s a reason that this region is known for its food and libations. BlackBird Cider Works provided New England Style and Dabinett English Style cider; Arrowhead Spring Vineyards brought a range of their award-winning wines (the Riesling was my favorite) and Black Willow Winery brought a mead that paired deliciously with a mini mile-high apple pie provided by the Village Bake Shoppe. An appetizer meat board and cheese plate from Carmelo’s, and roast pig with wine glaze and sumptuous side salads, courtesy of Dispenza’s, made for a spectacular evening. The only thing that I regret is that the soldiers who originally defended Fort Niagara didn’t get a chance to dine nearly as well; rations back in the day only included peas, flour and bread. That, and the fact that they slept 20 to a room in the fort, (which you can wander through at your leisure), made them understandably ready to fight.